Welcome to Dag-Lit Central for 2012. I’m really please to start the year off with a visit from Anastasia V. Pergakis who is popping in as part of her Cleanse Fire blog tour. 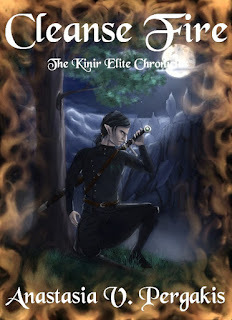 Jonathan has graciously allowed me to visit his blog today as one of the stops for my blog tour for my debut novel, Cleanse Fire: The Kinir Elite Chronicles. Thanks so much for having me Jonathan. He told me the theme for his blog is “writing that stands out from the crowd.” Way to put on the pressure Jonathan! I thought to talk about how the idea of this story came to me, since it mentions my Dad and how proud I am of his 20 year military career. However, I promised myself I would not repeat posts during this tour, so I had to rethink. I decided to give some more behind the scenes information about the world I created for this book, specifically the language I made for my elves. When I started writing this book, I didn’t have much to go on in concern to the world the characters lived in. Just a few notes here or there to get me started. As I wrote the story, more and more about the world came up either in the story or just as random information popping up in my head. When I was finished with the first draft, that is when I really sat down and filled in the blank spaces for my world. The fun part when filling in the spaces was deciding on the language the elves, and other creatures, spoke. I thought at first to create an entirely brand new language, like Tolkien did, but that proved to be more complicated than I wanted! So, instead I turned to Latin. Why? Well, it has that ancient sort of feel that I wanted my elves to have. They live very long life spans and their world has a deep history to it. Having them speak Latin as their “Ancient Language” fit. After all, Latin is our “ancient language” too. I’m sure that I fumbled up some of the Latin phrases in my book – as in they are most likely far from accurate. But, hey, it’s a fantasy book in a world other than Earth, so I can just say “It’s accurate for them.” Still, it was fun looking up translations and figuring out what words and phrases they would actually use with the ancient language. I also like the phrase they use when going into a mission, “Vivo Liber. Morior Bonum.” Translated directly it’s “Live Slow. Die Fast.” which basically means to live a long satisfying life but don’t suffer in death. There are more words and phrases sprinkled throughout the book. And more will come to light as the series continues. It’s interesting to me to create new worlds, including languages. In Book 2 of the series, Blood Trade, I have a new race of creatures coming into light and I’m having fun creating a few phrases for their language as well. What about you? Do you create your own languages for your stories? Why or why not? Do you just come up with a few phrases or an entire language? Anastasia knew she always wanted to write. She began at a young age, writing those little stories about the apple tree in the yard. Though her love of stories stayed with her through her poetry stage in high school, she didn’t begin writing novels until she was almost an adult. That’s where she found her true passion. Her characters visit her dreams – and sometimes during the day – to share their stories with her. Anastasia is merely the writer, but the characters are really the storytellers. Anastasia lives in Columbus, Georgia with her husband and son. A stay at home Mom, she loves spending time with her son during the day, then writing furiously at night. I’m giving away an e-copy of Cleanse Fire! Leave a comment on this post to enter into the random drawing. I’ll draw the names at the end of my tour, January 31, 2012. If you want more chances to win a copy, visit our website to follow our tour! The more comments you leave, the more chances you have to win!